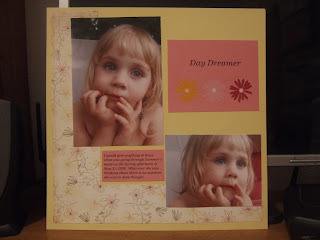 This page is of my niece Summer from our last trip to visit her. She is such a cutie. Thesolid paper is from my stash, and the pattern paper is from Crate Paper Twirl Collection Girly Girl. I wanted to go with a more soft look to the page, more of dreamer look. The Pattern paper is double sided so I took the left over flipped it over and printed my journaling and title on it. The flowers under the title are from TLC rubons (if you look the last flower messed up the rubon slipped but its not the noticeable)- I would have redone it put I only had one package of the rubons. Journaling Reads: I would give anything to know what was going through Summer's mind on the Spring afternoon of May 31, 2008. What ever sh was thinking about there is no question she was in deep thought. She looks like she is goin into her own world LOL!